The year is 12,090 A.D., and what little is left of humanity has finally crawled out from the ashes of war and destruction. From the darkness of fallout, mutants and a race of vampires known as the Nobility have spawned. They rule the weak with no remorse. Once bitten by a Nobility, one is cursed to become a member of the undead. Villagers cower in fear, hoping and praying for a savior to rid them of their undying nightmare. All they have to battle this danger is a different kind danger – a Vampire Hunter. Enter D – a lone, mysterious vampire hunter, sought out by the desperate Doris Lang. Bitten by the vampire lord Count Lee, Doris is destined to her unholy fate... Can D deliver her from her curse and bring her to salvation, or will she forever be part of the unholy dead? With the advent success of the Vampire Hunter D novel series, co-published in English by Digital Manga Publishing and Dark Horse Press, DMP continues to push the envelope, bringing what every manga, sci-fi and horror fan has been waiting for. 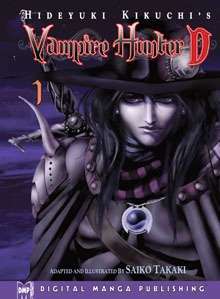 For the first time in manga form, Digital Manga Publishing presents their flagship title – Hideyuki Kikuchi’s Vampire Hunter D – to fans in North America and around the world. Be a part of this simultaneous, worldwide, multiple language release! This title was added to our catalog on September 19, 2011.